Gummy Army Men « Gluttoner: You gonna eat that? 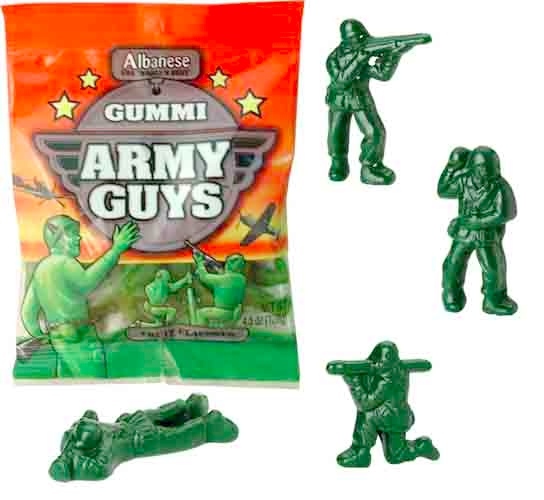 The “Army Men” plastic figures that you played with as a kid are now available as a tasty gummy treat. Gummy Army Guys come in the four classic army guy poses and weaponry. Each packet has 12 yummy men in it. But unlike the weird tasting (what, you didn’t have an older brother?) plastic guys of your youth these guys are pure sugar. Would make a good gift for the boys overseas, the boys next door, the boys in the hood, the boys of summer, the boys on the side, or the kids in the hall.